Hello Ladies. I have been meaning to write this post for a while now but have never got round to it. I am constantly buying and trying new things so each time I buy a product, I take pictures and they end up stored away on the laptop until I get chance to review them properly. These new(ish) 'Blush by 3' palettes from Sleek have taken the blogging world by storm recently and it seems lots of people have struggled to get their hands on a few of them. Before I came to Oz, I decided to have a look at them in my local Superdrug and see what all the fuss is about. There are five palettes in this range and I must admit, I was instantly drawn in by them. At £9.99 for a chic looking palette containing three large blushes and a huge mirror, I was sold. I decided a palette of this nature would be perfect for my travels as it would be pretty much all I'd need. When I was looking through the colours, I realised the palette I wanted originally in the shade 'Lace' was sold out. I had read quite a lot of reviews on it and the shades looked beautiful swatched. However, not one to let a small mishap like this stop me from purchasing, I decided to opt for a different shade. In the end I went with 'Pumpkin'. I have to be honest, it was the best of a pretty shoddy bunch and I didn't have the highest of hopes for it. In the pan these three colours look super clown-like bright. I basically had the option between very bright or dark Morticia shades so I obviously went for the brights. In the back of my mind, a little voice told me to buy it anyway as the colours would probably look much different when applied with a light hand and blended out. I agreed with this little voice in my head and off I plodded to the till. After all, £9.99 wasn't going to break the bank too much and the palette itself looked too pretty to miss out on. When I got home, I just had to give it a try and see how the colours would look on my cheeks. I was pleasantly surprised to find that when applied with a light hand, these colours are very pretty. I especially like 'Lantern', the shade on the left, which is the most subtle and 'normal' looking in the palette. It gave my cheeks a very pretty peach flush and didn't look too harsh in the slightest. Not being a pinks person, I've slightly neglected 'squash' which is the neon pink shade in the middle of the palette. I did try it once and when swatched and blended, it is very pretty. If you like pinks, I'm sure you would love this. As for 'P Pie', the bright, bright, bright orange on the far right of the palette, I was actually scared to apply this to my face. However, I had a very pleasant surprise and found that I actually really like this colour. When applied to the cheeks with a light hand, it looks nothing like it does in the pan. It added a nice warmth to my face and as I prefer orange/peach tones, it worked well for me. On the back of the palette, Sleek claim that these blushes are a mix of 'shimmery and matte' finishes but I don't think any of them are particularly shimmery. Not that I'm complaining as I'm not a huge shimmery blush person anyway. I'd say Lantern and Squash are more of a Satin finish and P Pie is matte. One last thing I would like to emphasise is the term 'a light hand'. 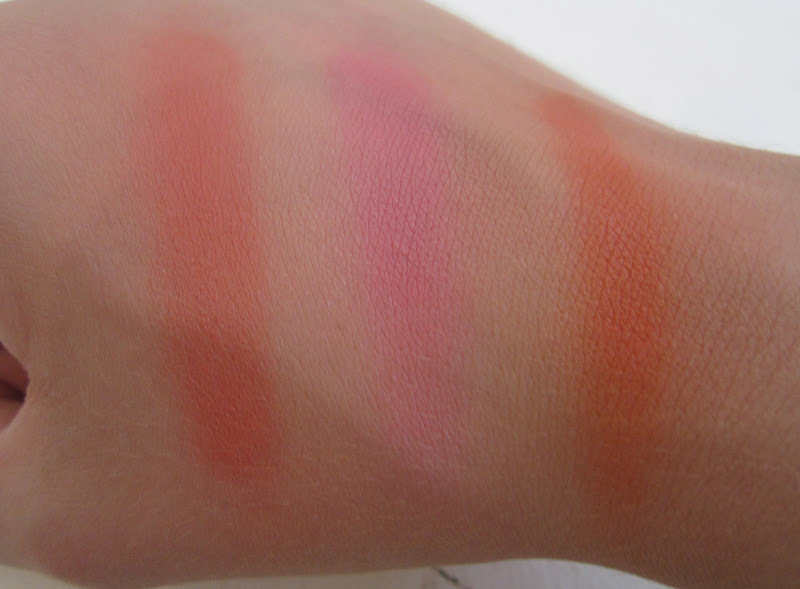 As you can see from the pictures above, when heavily swatched, these colours are extremely pigmented and could potentially turn you into clown face with the wrong technique. I apply these lightly to the apples of my cheeks and sweep the colour up towards the top of my ear to create a subtle look. I must admit, I'm not the biggest blush person in the world but I do really like this and I love the whole 3-in-1 concept. They are perfect for travelling, contain a whopping 20g of product, will last a lifetime and are relatively cheap. What more can I ask for? I still want to snap up the 'Lace' shade but if you do want to buy one of these blush palettes, don't let the bright appearance of 'Pumpkin' scare you off. Give it a swatch and you might be very surprised. I think these colours are perfect for summer holidays and tanned skin! Have you tried any of the Sleek 'Blush by 3' palettes? They are available to buy in all Superdrug stores. This looks like a really nice palette and I keep saying to myself I must try some Sleek products! I really like your blog too! The blushes look gorgeous! I've been wanting to try sleek for ages! I might just have to order some products and pay the shipping to the US! :) Have you tried out any exclusive Australian makeup? I tried looking for this palette the other day but it's not there at my local superdrugs :( wondered if they already discontinued it! i want to try it! they look so bright and pigmented! My suoerdrug does not stock the blush pallete! boooo! Really love this. I still love my contour kit by Sleek, there stuff is cheap but good! My have to try this too! This looks like such a great palette, sleek is so bargainous!! I definitely need to check this out when I'm next in superdrug! Ah squash looks lovely, I don't think I could pull of pumpkin though! I really want to try one of these palettes! Like you, I want 'Lace' too but after seeing this one I think I need this too. I can imagine the shade Lantern being really flattering on all skintones! I've been considering buying this palette for a while but havent, yet now after reading this I want it more than ever! I've been converted ;)Great post love! heey! I've been looking for a good blush -- can you post pictures of you wearing them?? pondering if these colours would look good on such a pale complexion as mine! They are so pretty! really need to buy these, the colours are so pretty!